Stonehenge, England. 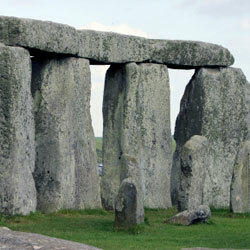 The problem is not the famous stones, which are mysterious and magical. The problem is that you are not allowed to get close to them, because earlier tourists chipped away at the rocks. Instead, go to nearby Avebury, a town inside a stone circle where you actually can touch the stones. The Blarney Stone, Ireland. It is overrun with tourists, there are long lines, and when you actually get to the stone, an employee holds you upside down so you can kiss a rock that hundreds of people before you have already slobbered all over. Gross. Instead, spend your time walking around the beautiful grounds of Blarney Castle, and leave the long waits and the germs to other tourists. The Pyramids at Giza, Egypt. These are the most accessible pyramids, not necessarily the most impressive. And being accessible makes them crowded with tourists, guides and tons of people selling things. Instead, visit the more remote – and more peaceful – pyramids at Dahshur. The Leaning Tower of Pisa, Italy. Yes, it leans, but that’s it. So do you really want to mill around with hundreds of other tourists to see something that looks exactly like you expect it to look? Instead, visit the Duomo di Pisa, the town’s beautiful, art-filled cathedral. You even can see the tower from there. The Prague Astronomical Clock, Czech Republic. It is the world’s oldest working astronomical clock. But the animated figures appear only once an hour; the rest of the time, it’s just a clock. Instead, if you really like clocks, check out the wonderful collection at the Musee d’Orsay in Paris. Times Square, New York. Although it is safe to go to Times Square now, why should you – unless you like thousands of tourists, aggressive vendors, nonstop noise and neon, and chain stores and restaurants. Instead, check out the amazing museums the Big Apple has to offer. Hollywood Walk of Fame. Much like in Times Square, there are just too many people, peddlers and hokey shops to make it worth a trek to see stars bearing the names of famous people. Instead, visit Madam Tussauds Wax Museum in Hollywood. The stars aren’t real there, either, but at least they are three-dimensional. Manneken Piz, Brussels, Belgium. It’s just a fountain featuring a statue of a naked little boy answering nature’s call, but for some reason, tourists flock there. Instead check out the Brussels fountain of a dog answering the same call. Or skip it altogether. The Equator, Ecuador. The biggest problem here is that it isn’t the actual equator; that’s hundreds of feet away. Instead, if you are fascinated by longitude and latitude, head to the Greenwich Meridian Line in England – which actually is where the signs say it is. The Little Mermaid statue, Copenhagen, Denmark. This is only a copy of the actual statue. Plus, the replica – which is a tribute to Hans Christian Andersen, the author of the original story, and not to Disney – is very small and hard to get a good look at. Instead, head for the statue of the author himself in New York’s Central Park.